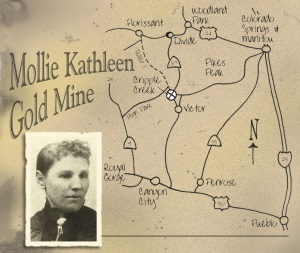 Our family arrived early at the Mollie Kathleen Gold Mine, eager for the tour of our lives. Together with my three sons, I had just finished backpacking through the high country of Colorado. Mollie Kathleen never realized that underground tunnels would one day provide a silent testimony to the speed at which formations can grow. Click for larger view. Our excitement grew as Dennis Lanning, the mine owner, fitted us with hard hats, miners’ lights, and jackets. He warned that we would be walking through some water. 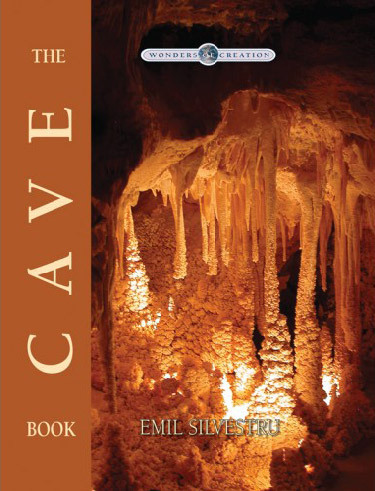 I should have realized that caves, even man-made ones, go hand-in-hand with water. We filed into the primitive ‘man-skip’, listened as the door clanged shut, and held our breath as we rattled down into the darkness. 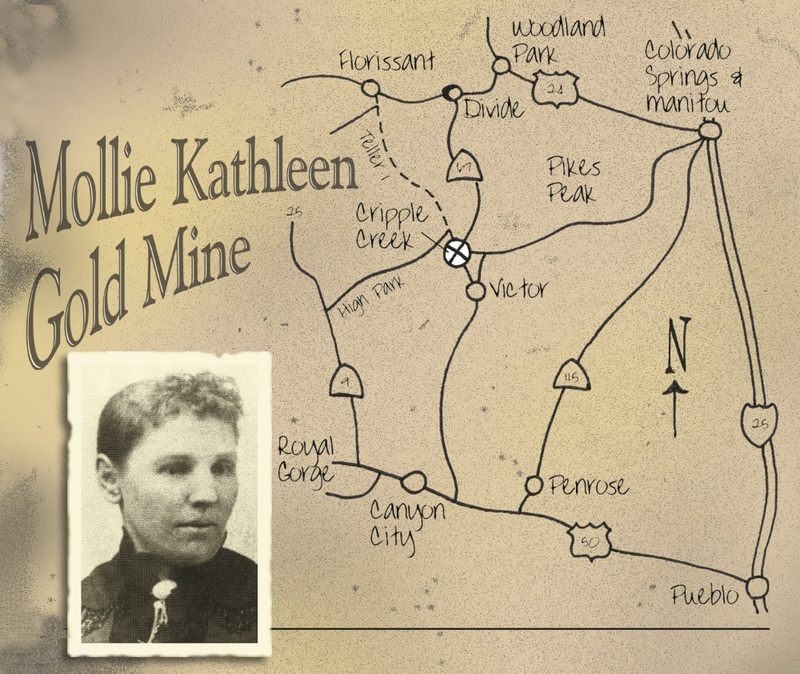 It was during a hiking adventure in 1891 that Mollie Kathleen Gortner discovered a rich outcropping of gold at Cripple Creek, Colorado.1 She became the first woman in history to register a mining claim in her own name. Altogether, more than 500 underground gold mines worked the rich seams inside the crater of a dormant volcano, 10 km (6 miles) across. Over 625 t (22 million oz) of gold–US$6 billion on today’ market–were produced before the rush declined in the 1950s and ‘60s. The skip stopped. We were 300 m (1,000 ft) inside the Earth. As we walked through the narrow tunnel, our lamps threw eerie shadows. The glistening walls were covered with amazing shapes–crystalline formations like flowers, but made from calcite and sodium chloride. Paula, my wife, commented on their beauty. Columns were everywhere. An old wooden chair had stalagmites sitting on it. A small stalagmite was even growing up from a discarded explosives container. In places, the columns were profuse, reminding me of bars in a jail, or pipes on an organ. Some were huge, up to 2.7 m (9 ft) tall and 10-12 cm (4-5 in) in diameter. Stalactites and stalagmites were everywhere. They grew from the ceiling, floor and walls. The fine ones were hollow inside and called straws. They dominated many parts of the mine, often making it hard to manoeuvre. Lots of them had grown all the way from the roof to the floor, and would become the foundations for future columns. And the colours! A kaleidoscope of red, blue, green, turquoise, pink and orange surrounded us. The bright green, azure and blue pointed to the presence of copper. The stunning rose pink and red suggested manganese. Dull yellow and grey hinted at magnesium. Even iron got into the mix of things, colouring columns with spectacular orange, red and yellow. Around one corner, the mine became snow white with calcite and sodium chloride. But here, before my eyes, I was looking at things that should not exist. I was starting to comprehend their significance. It was obvious that these wonders had not taken millions of years to form. Dennis explained that they only began growing after 1961, once the mining operations ceased and the airflow to the tunnels was shut off. 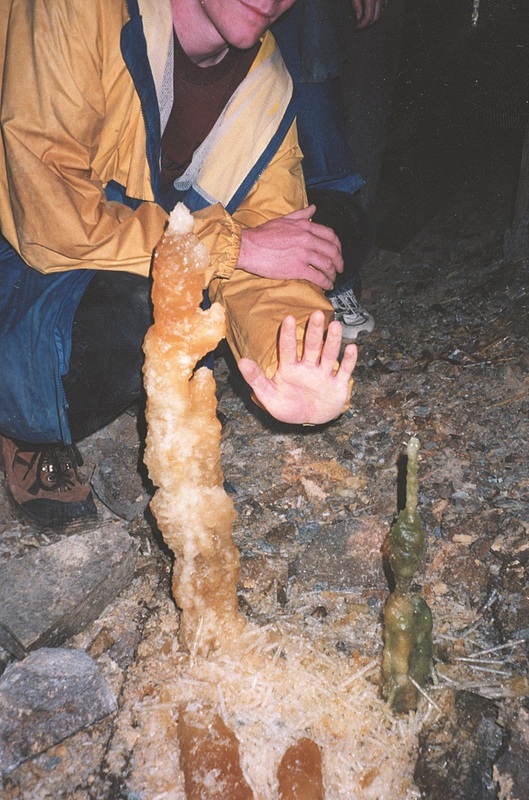 The rate at which this stalagmite has grown can be gauged when compared with a human hand. Click for larger view. There had been an amazing growth in the last 20 years. Some formations were only five or ten years old. New soda straws, 60-90 cm (2-3 ft) long, had appeared in that time. According to Dennis, the principal factors for growth are high moisture, low airflow and no sunlight. When the conditions are right, time is not that important. Neither does temperature make much difference. We noticed that the first tunnel we entered was cool–around 15°C (58°F) as you might expect in a natural cave. However, we found other parts of the mine quite warm, due to the heat coming from the walls. Something else gave my million-year thinking a jolt. I saw with my own eyes that wooden frames, used to support the mine, were becoming petrified. I even found that one log had almost completely transformed from wood to mineral. We came away from our tour of the Mollie Kathleen Gold Mine with a new appreciation for the age of things. If all those features could form in less than 40 years, imagine what could happen in 4,300 years since the global Flood described in the Bible. 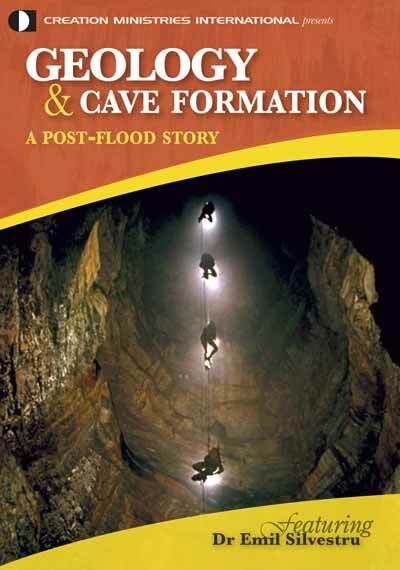 The Flood would mean an abundance of water with high mineral content draining through the Earth–ideal conditions for making magnificent formations in caves. Contrary to what I had been taught, Mollie Kathleen convinced me that the events and timescale described in the Bible make sense. Gary Livesay is an electronics technician who is currently working as a broadcast engineer at a CBS affiliate in Indianapolis, Indiana. Gary has developed a special interest in young-Earth science issues. Tour the famous Mollie Kathleen Gold Mine, Brochure, Gold Mine Tours, Cripple Creek, Colorado, 1999. Return to text. 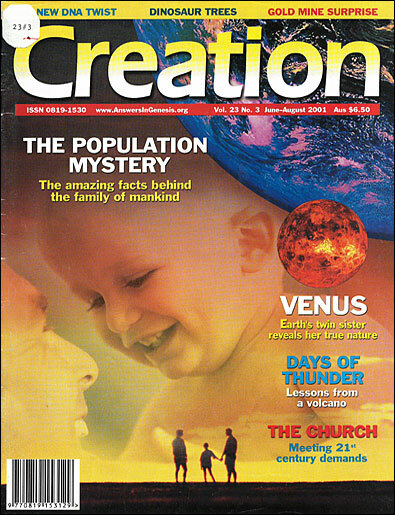 The million-year story has not changed. See for example: Natural Features, nps.gov. Return to text.